The holidays are coming! Just over 2 weeks until Black Friday (and Thanksgiving of course), then quickly Christmas comes around the corner. Which means it's time to kick off the 2015 My Stocking series! I have done this series with guest bloggers for 6 years now(!) and for this 7th year, I decided to change it up a bit. 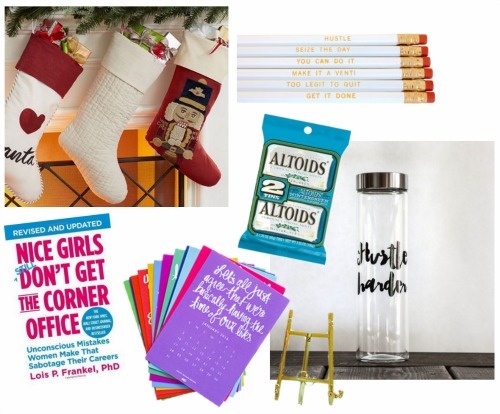 Boston Bloggers will be sharing gift ideas in a "My Stocking" that fit a gift guide theme. The catch is the gifts must be small enough to fit in a stocking! Here's the first gift guide; many more to come! Hi everyone! My name is Kerri, and I blog over at Haven Way about career advice and balancing career & home. My (dream) stocking is the Linen Channel Quilted Stocking from Pottery Barn, and it's filled to the brim with office necessities. Nice Girls Still Don't Get the Corner Office is recommended reading for women in an office setting at any stage of their career. The corners of my copy are practically worn through from all the times I've flipped through for advice on the fly. The ABD Desk Calendar is the perfect mix of femininity & professionalism. It provides a little motivation on each brightly page every time you need a quick date reference. Altoids are an office must-have for killing the dreaded coffee-breathe en route to a meeting. The #whistlewhileyouwork Pencil Set set has just the messages you need to keep you going & get it all done. And the Hustle Harder Glass Water Bottle keeps you hydrated & motivated during the work day. Happy Holidays! Thanks, Kerri! Visit Haven Way and follow on Facebook and Twitter.